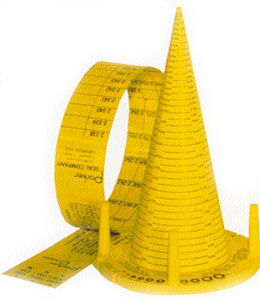 The Parker Size Gauge for O-Rings is an exclusive Parker Seal Group device consisting of a uniquely marked plastic cone with special Cross-section measuring base and a separate pi tape. The Parker O-Rings for gauges sizing device is used for checking any sample O-Ring up to eight (8.00″) inches in diameter to determine the nearest standard Parker Seal 2-dash size (corresponding to ARP568A standard series O-Rings). NOTE: The device does not measure actual dimensions. Proper identification and markings appear on the cone and tape, making the device easy to read. The cone and tape are sold as a set. For positive measurement every time, use the National O-Ring identification gage for accurate measurements of O-Ring I.D. Measures As568A dash series, -001-050, -102-178, -201-279, -309-382 and -425-455.